According to Commander Michael Shea, the director of Saint Michael’s Legal Center, "there are a lot of people in our society who just can't afford a lawyer." The clinic, which is housed at WMU-Cooley Law School's Tampa Bay campus, helps to bridge that financial gap, a crevice that is over 50 percent in the family law area. "We here at St. Michael’s are often the last resort for people," noted Shea. "We also, at the same time, are kind of like a teaching hospital for lawyers. We’re the place where you can go and get some good legal advice and help. We have a large number of law students who participate in our program. They give us the ability to expand our services to the community, and at the same time, for the law student – for the potential lawyer – the opportunity to learn an awful lot about the actual practice of law and gain real, hands-on practice in family law." 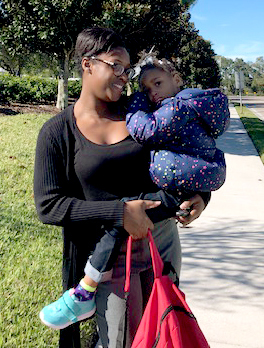 The clinic takes helping others to heart, even taking time out on New Year's Eve to help reunite a mother and her daughter at a court hearing that day. Making that kind of a difference in the Tampa Bay community is at the core of what St. Michael's Legal Center is all about says Shea. Shea is also excited about the clinics ability to now offer, not only pro-bono, but low-bono services at St. Michael's. A service especially needed by families in the area. "The word pro-bono indicates we have a group of lawyers who are willing to help people who can’t afford anything as far as a fee is concerned," started Shea. "They are truly at the poverty level. We, at St. Michael’s, have gone higher than some of the agencies in our area. They’re limited by federal funding to 125 percent of the poverty level; $16,000 in layman’s terms for a single person. And so that would be the limit. "Our clinic has been able to get the Supreme Court to approve us up to 225 percent, or $32,000 for a single person. Of course there are a lot of people who still can’t afford a lawyer, or who have limited resources, with an income of only $32,000. So we have now instituted what we call low-bono which picks up at that $32,000 or 225%, and we’ll go on up to what we’d say or what people find themselves as the middle class. Most people in our system can’t afford $5,000 or $10,000 to lay out to try and get some child support, or something of that type, so we have this low-bono program, which has very low structured fees, making getting legal advice or help affordable. We know that over 50 percent of the people who go to family law court can’t afford a lawyer. St. Michael's is trying to service that group." Law students, like medical students, are taught how to write a "plan of treatment, " just like doctors do says Shea. They learn from the get-go how to handle client intake as they hear about real legal problems, from real families. "The students are put on the phone, talking to people with legal problems, trying to sort out all the issues in each case," described Shea of what WMU-Cooley law students learn in the clinic. "After intake, they get back with staff practicing lawyers, and together work out what needs to be done for these people. After we write out the clients plan of treatment, we invite the folks in for a consultation and decide what type of action needs to be taken in their particular case. The law student is totally involved in the case, from the very beginning of the phone call to whatever action we decide to take. It’s a wonderful opportunity for young lawyers to get real experience in practicing law." One thing that is different about St. Michael’s, according to Shea, is that the clinic is "more into counseling people than making overhead." He feels their major role is teaching law students how to help people, and to "get through a tough spot in their life." Shea talks about the clinic having two cannons of ethics that they adhere to. "One, of course, is the Florida Bar for all attorneys, but the other is a cannon of ethics that is Christian-based. And, in that, we are saying that we do not want to get involved with people who may have a grudge, or something like that. We are more interested in trying to make a unified family and putting people back together. We work to get them to overcome their prejudice and to work together in parenting their children. And so a lot of times, the law part of it is really easy. It's the people part that is critical. The most important thing in our conference rooms is a box of Kleenex, and we really take what we do in helping people and families very seriously."